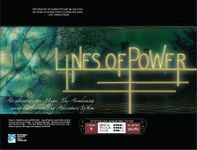 Lines of Power is a complete story that can be fitted seamlessly into your Mage: the Awakening chronicle or run as a stand-alone scenario. Contained within are all the pieces you need to run a fun and exciting story. If you want to improvise along the storyline, there is plenty of elbow room for all the little adjustments that make a tale your own. This document provides the general layout – characters, locations, various clues – for your players to explore, and hopefully evoke new and improved roleplay to deepen their characters. Only you, the Storyteller, should read this (the exception being the description of the Tellurian Legacy, which is available to the characters in your chronicle). This book is intended to be used with the rules systems in the World of Darkness Rulebook and Mage: the Awakening. Two useful supplements for this story are Sanctum and Sigil and World of Darkness: Armory, but neither is required. This story works best with a cabal with established Sanctum and Hallow merits.